Standover 101, Give me 30 grand (happens to be the price for a nice harley) Give me your bike, and give me your car….fill in the rest. Great to see the cops scooping these steroid pumped bludgers off the streets one by one. If we allow them to just come and standover folks demanding cash and to take possessions we will never ever win the war against them. 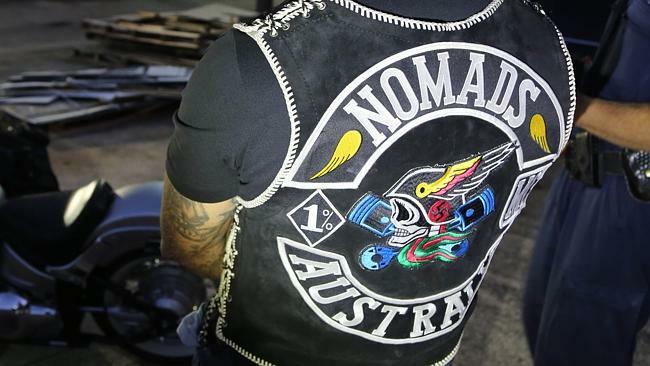 THE two-state raids that smashed the powerful Nomads Motorcycle Club were sparked by threats of blackmail, payback and retribution against two SA men, a court has heard. Prosecutors today asked the Adelaide Magistrates Court to remand two of the men in custody, despite their being granted bail when arrested in NSW last week. Sandi McDonald, SC, prosecuting, said the allegations against the duo and their 10 co-accused were some of the most serious examples of bikie-related crime. “In November, these men flew in from NSW, met up with the complainant, took him to the Adelaide High School oval and demanded $30,000, his car and his motorbike,” she said. “He was taken to a motel where he was threatened, assaulted and told he was going to die. 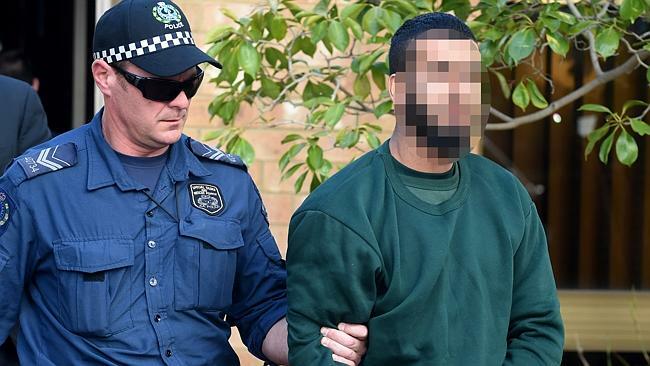 The man, whose identity is suppressed, is one of eight Nomads to face court today in the wake of last week’s raids by SA and NSW police. Four members faced court last week, and one was supported by the gang’s national president, Sleiman “Simon” Tajjour. Six more were extradited from Sydney on Friday — they did not apply for bail today and were remanded in custody until August. One of the Nomads who faced court in Adelaide today, with a supporter. The remaining two men travelled to Adelaide today under bail agreements imposed by the Paramatta Magistrates Court following the raids. Each has yet to plead to a raft of blackmail, assault and threaten harm charges taking place at locations across Adelaide between November 2014 and March this year. 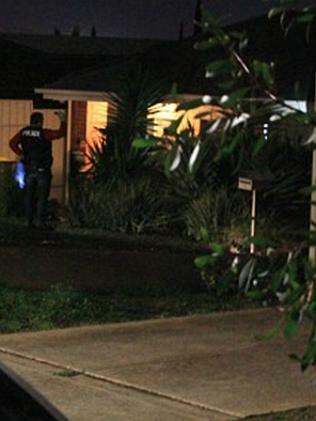 A final co-accused remains at large and is the subject of an arrest warrant. The identities of the victims, and any information which would tend to identify them, are suppressed by order of the court. One of the Nomads who faced court in Adelaide today. Under SA law, a person charged with bikie-related offending is automatically banned from receiving bail unless they can show there are special circumstances warranting their release. Today Michael Dadds, for the first of the two bailed men, said his client’s liberty should continue so he could return to Sydney, continue working and continue caring for his two children. He said his client had severed his ties with the Nomads. “He had been attempting, for some time, to disassociate himself from the club and, in January, he successfully did that … it was a delicate process,” he said. A member of the Nomads Motorcycle Club being extradited from NSW. Mr Dadds said his client had attended a police station and signed a statutory declaration about his disassociation — “one of, if not the first” NSW bikie to do so. He said the court should not place great weight on the allegations made by the complainant. “The allegations are denied and there is a real question, in this case, about the reliability of the complainant,” he said. Ms McDonald said that was not the case, as police had sourced CCTV footage from Adelaide Airport, the high school and the motel that matched the complainant’s account. She said the court should not place great weight on the man’s claims of having disassociated from the Nomads. “What I have been advised, through police in NSW, is that this defendant was charged with consorting offences and, during his police interview, claimed he had disassociated,” she said. “Police asked him to fill in one of these forms, which were being piloted at that stage, and he did so. Magistrate Jayne Basheer refused the man bail and remanded him in custody until August. Paul Mazurkiewicz, for the second man, said his client be allowed to remain at liberty because, on the police version of events, he “played a lesser role” in the alleged offending. He said his client was barely mentioned in the complainant’s statements to police and, when he was, it was him leaving a room or standing nearby while others uttered threats. “All these allegations of gouging out eyeballs, firearms, being held down on beds, threats, demands for money, they don’t involve my client,” he said. Mr Mazurkiewicz said the man who faced court on Friday was the “mover and shaker” in the incident, as described by the complainant’s witness statement. “The complainant says he saw my client leave the room before (the man who appeared on Friday) demanded he continue to tell the Nomads he was not able to come up with the $30,000, but he still had to pay (that man) the $30,000,” he said. “(That man) also told the complainant if he ever told anyone about it, he would kill him. He said his client had left the gang and now “faced consequences” as a result of that decision. Ms McDonald said the man should be remanded in custody, saying he played far more than a “peripheral” role in the incident. She said he had menaced the complainant physically, by standing close to him and raising his fists, and verbally by agreeing with and supporting threats made by others. “It was not a stroll in the park — it was heated and animated,” she said. Ms McDonald said the man was part of a 13-strong group that flew to Adelaide, threatened the complainant “as the first thing they did” and then “flew out the next day”. “These people put themselves in the one per cent of the population that holds itself above the law and this is what they do — retribution and intimidation,” she said. She said that, when the man was arrested, he was found to be in possession of a sawn-off .22 calibre rifle and a loaded magazine for an SKS assault rifle. Magistrate Basheer remanded the man in custody overnight and will hand down her ruling on bail tomorrow. Twelve Nomad bikie gang members have been arrested and charged with a range of offences, including solicit to murder. FOR nine months, police have tracked the Adelaide chapter of the Nomad outlaw bikie gang amid allegations of extortion within its own ranks. Today, the gang is in shreds after being smashed by a two-state police operation, and eight South Australian Nomads, including two of the gang’s highest-ranking patched members, are in jail. A ninth is on the run. Charges against a total of 12 people include soliciting to murder, kidnapping, blackmail and assault, and police say they have dealt the gang a “significant blow”. The group only has 10 or 12 patched members in Adelaide and The Advertiser understands it has been established in SA for about a year. Assistant Commissioner Paul Dickson said the SA president and sergeant-at-arms, as well as the NSW-based national vice president, were arrested as part of the operation. He said the victims were other members or associates of the gang. “All of these offences were committed as a result of the victims not undertaking the required acts set out by the Nomads,” he said. Mr Dickson said the allegations showed what outlaw bikies were capable of, especially as the offences were allegedly committed against their own. “They are quite happy to harm the community and they are quite happy to harm their own members if it suits them,” he said. He said there were 10 outlaw bikie gangs operating in SA, with about 300 members. “About 25 per cent of OMGC members are in police custody or under some sort of condition, like parole,” he said. Director of Litigation Research Unit at the University of Adelaide David Caruso said arrests of this scale send a clear message to the club. “The police are obviously confident they have built a significant case to say that there are at least this number of people involved in a criminal enterprise,” he said. As part of the operation, more than 170 officers from SA and NSW conducted raids across the two states, with 18 Adelaide properties searched. Police will allege the offences happened in SA between November 2014 and March 2015, and the 12 arrested people were either full members, nominees, prospects or associates of the Nomads. “These are well-organised criminal gangs driven by a culture of self-interest and violence internally and within the community,” Mr Dickson said. Five South Australians, aged between 24 and 50, were arrested in NSW and have appeared in court for extradition back to their home state. 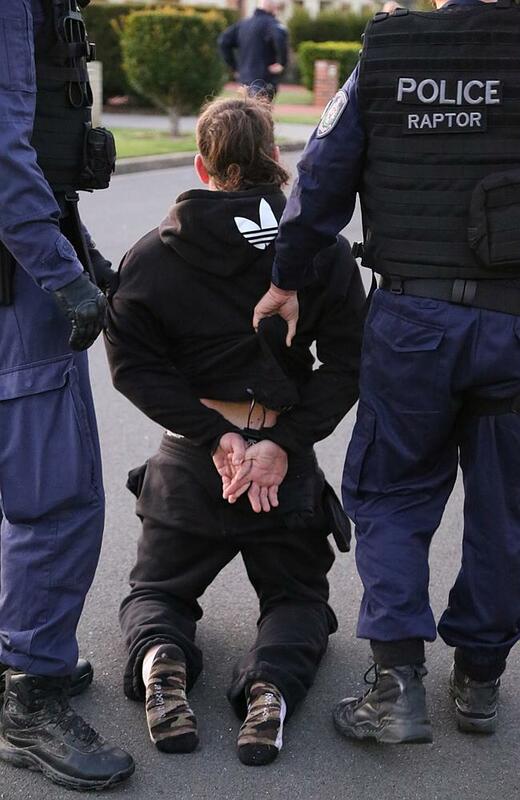 Another three South Australians – from Andrews Farm, Parafield Gardens and Pennington – were arrested in Adelaide and were in court on Wednesday. 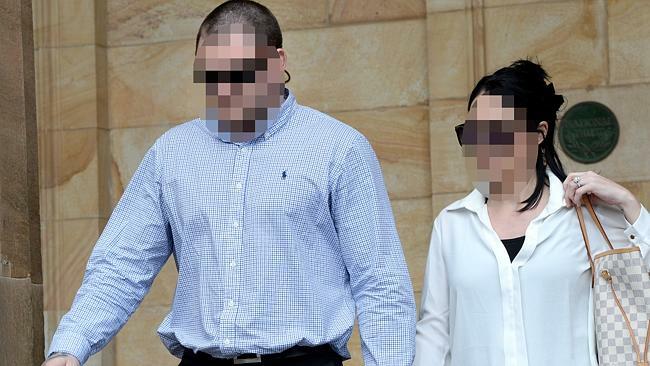 Of the four NSW residents arrested, three will face extradition to Adelaide. ■ A Clearview man, 24, will appear in the Goulburn Magistrates Court today for an extradition hearing. He will be charged in SA with solicit to murder, two counts of aggravated blackmail, participating in criminal organisation, aggravated assault causing serious harm with intent and aggravated kidnapping. ■ An Elizabeth North man, 26, will appear in the Goulburn Magistrates Court today for an extradition hearing. He will be charged with aggravated assault causing serious harm with intent, false imprisonment, participating in criminal organisation and aggravated kidnapping. ■ An Andrew Farms man, 26, was charged with aggravated assault causing serious harm with intent. 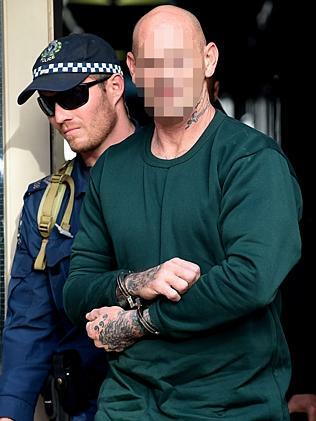 He appeared in the Adelaide Magistrates Court yesterday and was remanded in custody until August 4. ■ A Paralowie man, 50, will appear in the Goulburn Magistrates Court today for an extradition hearing. He will be charged with aggravated assault causing serious harm with intent. ■ A Campbelltown man, 31, will appear in the Goulburn Magistrates Court today for an extradition hearing. He will be charged with participating in a criminal organisation. ■ A Para Vista man, 40, will appear in the Goulburn Magistrates Court today for an extradition hearing. 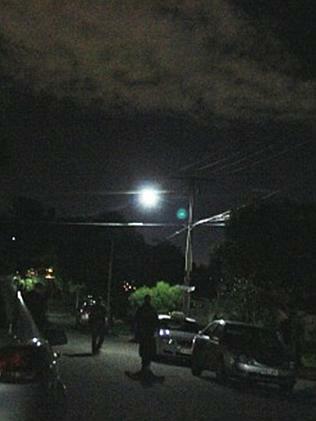 Police-supplied images of the Nomad bikie arrests – this arrest takes place at Clearview. Images of the arrest at Clearview. ■ A Parafield Gardens man, 37, was charged with aggravated assault causing serious harm with intent, false imprisonment, participating in a criminal organisation and aggravated kidnapping. 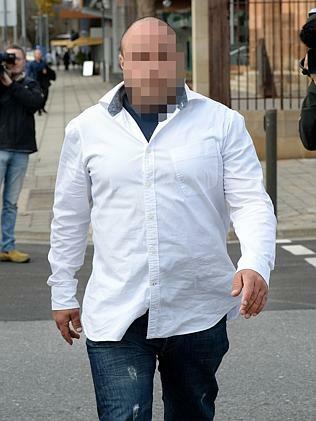 He appeared in the Adelaide Magistrates Court yesterday and was remanded in custody until August 4. ■ A Pennington man, 35, was charged with aggravated assault causing serious harm with intent, false imprisonment, participating in a criminal organisation and aggravated kidnapping. ■ A Sydney man, 30, has been arrested and following a court appearance will be extradited to SA to face two counts of aggravated blackmail, making aggravated threats to kill and cause harm, aggravated assault causing harm, blackmail and participating in a criminal organisation. ■ A 37-year-old man, from Kenthurst in NSW, was arrested and charged with making aggravated threats to kill and cause harm, aggravated assault causing harm and aggravated blackmail. 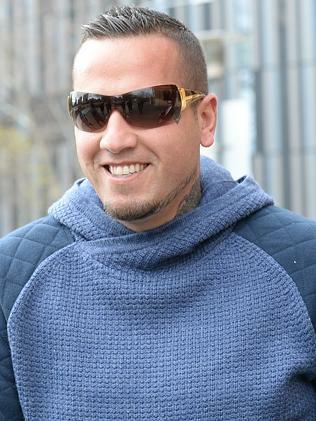 He has been bailed to appear in the Adelaide Magistrates Court on June 1. ■ A 30-year-old man, from Fletcher in NSW, was charged with making aggravated threats to kill and cause harm and aggravated assault causing harm. He is expected to appear at an extradition hearing in NSW today. 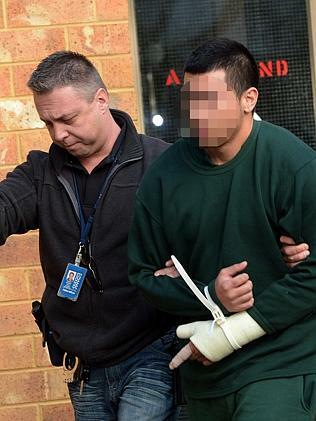 ■ A 26-year-old man, from Merrylands West in NSW, was charged with aggravated blackmail. 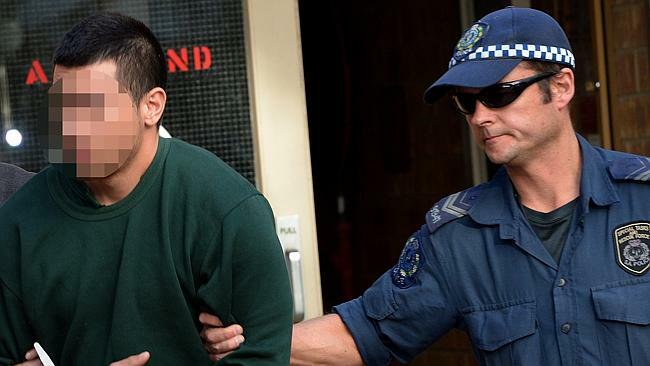 He is expected to appear at an extradition hearing in NSW tomorrow. Police have also issued a warrant for the arrest of a Paralowie man, 41, who is wanted in connection with this investigation. 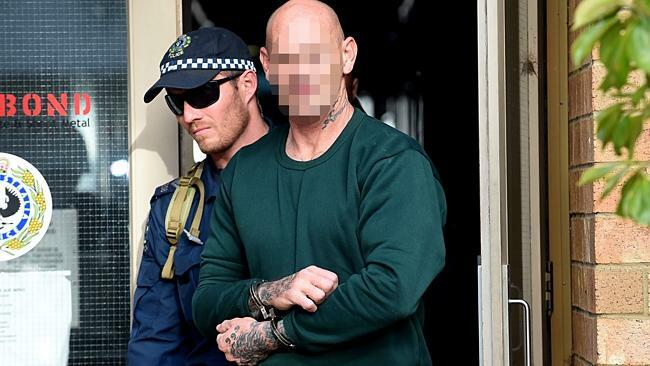 ONE of Australia’s most senior outlaw bikies has attended an Adelaide court to support an arrested colleague following raids that have left their gang in shreds. Nomads national president Sleiman “Simon” Tajjour sat in the public gallery of the Adelaide Magistrates Court today, while one of his crew sat in the dock in custody. The Advertiser understands that man, 31, whose identity has been suppressed, is a senior national office-bearer for the club. Mr Tajjour outside the Adelaide Magistrates Court, where he was supporting a colleague. Nomads national president Sleiman “Simon” Tajjour flashes a smile for waiting media. He has yet to plead to two counts of aggravated blackmail, making threats to kill and cause harm and aggravated assault causing harm. The man is further charged with blackmail and participating in a criminal organisation. 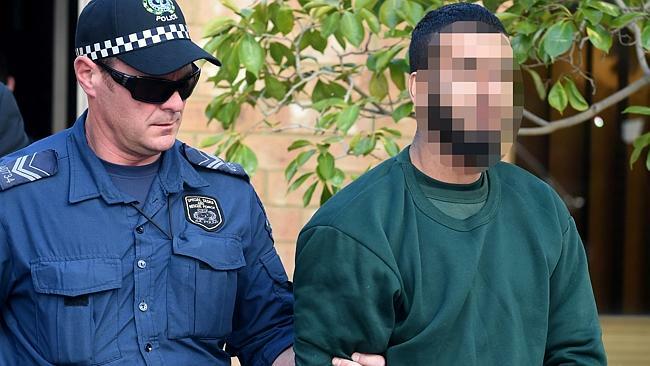 He was one of 12 gang members arrested yesterday in a two-state operation that involved more than 170 officers from SA and NSW. Mr Tajjour, who has not been charged with any offence, listened from the public gallery as prosecutor Sandi McDonald, SC, asked the charged man’s case be adjourned. A member of the Nomads gang being escorted out of the City watch house. “This is his first appearance, and this matter will eventually join up with the 12 other accused on a date that has been set in August,” she said. Ms McDonald said three of those accused had already faced court, while the others would be flown into Adelaide this afternoon to face court on Monday. She asked the man’s name and image be suppressed until police completed identification procedures. One of the Nomad gang members being escorted out of Adelaide Airport. Ms McDonald also asked the court suppress the names, images and anything that would tend to identify the two alleged victims in the matter. “By the next court date we will have received statements from the two alleged victims, which I understand are quite voluminous,” she said. Another member of the Nomad gang members being escorted out of Adelaide Airport. 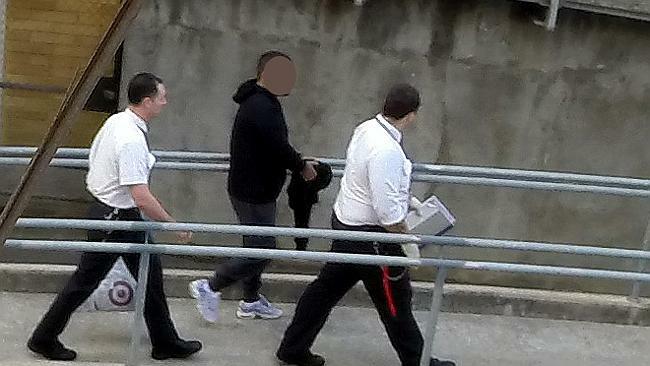 A third extradited Nomad gang member being escorted out of Adelaide Airport. The man’s Sydney-based lawyer, Omar Juweinat, said his client would be seeking release on bail and asked a hearing date be set. “The officer in charge (of the operation) is most likely going to be required for a short cross-examination during that hearing,” he said. Magistrate Jayne Basheer remanded the man in custody for a bail hearing next month, and to join up with his co-accused’s cases in August. Mr Tajjour declined to comment outside court, telling reporters to “ask my lawyer”. Mr Huweinat also declined to comment. This entry was posted in Australian Crimes, Crimes, Criminals, Drugs, true-crime and tagged Adelaide Magistrates Court, aussiecriminals, Australia, Australian Crimes, Bikies, gangs, Nomads, Nomads Motorcycle Club, Police, Sleiman “Simon” Tajjour, Sleiman Tajjour, standover tactics by Robbo. Bookmark the permalink.